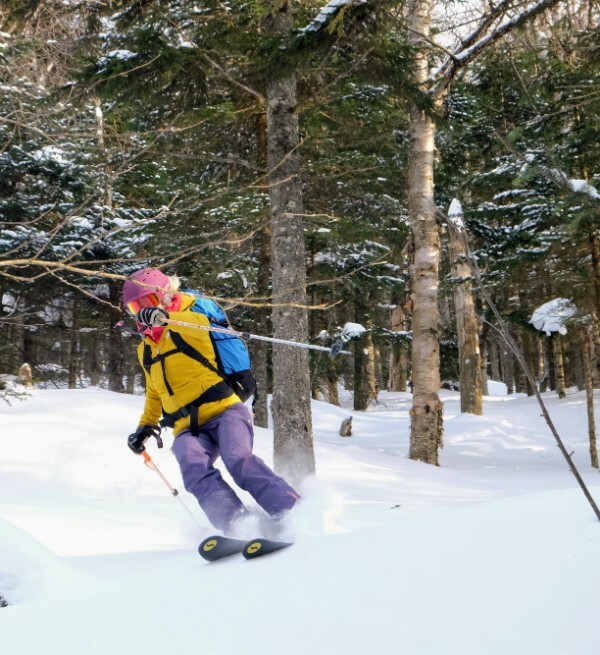 Wow, what a few years it’s been for our backcountry programs here at Bolton Valley. We’ve watched this community grow and thrive from a small group of dedicated folks to a burgeoning community of alpine touring skiers and splitboarders. Most mornings we see a steady stream of ants marching up the hill to snag first turns and a quick workout before work. Some days we bask in the glory of our uphillers and downhillers sharing the alpine terrain in harmony during lift operating hours. And it’s so fun to see the train of headlamps heading up after work in the mid-winter and to bump into friends at the top of Wilderness or Timberline in the spring to catch the sunset out across the Adirondacks. Bolton Valley has a proud tradition of pioneering growth within the sport. Years ago as skiers and riders sought out fresh tracks, we were amongst the first to really embrace in bounds gladed trails on our trail maps. Now we aim to blaze a similar trail with respect to our uphill and backcountry community. We’re asking for your support as we update our uphill policy in advance of the 2019-20 winter season. Starting next season, all uphill traffic will need either a lift ticket or season pass (all access season pass or backcountry/nordic/uphill pass) to be in compliance with our Uphill Trail Policy. This will include before, during, and after lift operations. Acknowledging that we don’t have a ticket window at all times, you will be able to purchase the appropriate uphill ticket or nordic/backcountry/uphill season’s pass on your phone anytime. Additionally, we’ve heard from several of our regular uphill skiers and riders, that wish they could access the terrain off Vista Peak. We are looking for an appropriate uphill route to get you there. And while we can’t promise we’ll find it in time for next season, we are really excited to announce that starting in 2019-2020, every nordic/backcountry/uphill season pass will come with 3 one ride lift tickets. These tickets can be used all at once to bring 2 friends or take 3 separate trips yourself throughout the season. Our mountain operations team works tirelessly day and night to keep our parking lots clear and to groom and maintain our trails. As interest in in-bounds uphilling grows, it has a corresponding impact on our day to day mountain operations. Some mornings, most of the upper base and Timberline parking lots are nearly full with backcountry enthusiasts. That makes our mountain hearts sing! It’s clear to us that in order to fully embrace this exciting evolution in our sport, it’s time to look for support from our uphill friends. At Bolton Valley, we are all about access to the mountain and we are so grateful to be a part of this human powered, uphill revolution. As we look to the future, we are committed to offering a quality resort experience for both uphill and downhill skiers and riders every day at Bolton Valley. I got out for a quick tour this afternoon with a friend, and got a little sampling of how our snow is holding up on south- and west-facing slopes. As the sun rises higher and shines longer every day, our south-facing terrain is continuing to build a layer of sun crust, which in some places is now fully supportive. This crust was covered by snow from the storm on Sunday night, as well as the snow squalls that rolled through yesterday, and that really helped the skiing on south-facing lines. West-facing terrain has a bit of the same crust but with less strength, and after being buried under the new snow it skied very nicely. That new snow layer is anywhere from 2-8” deep depending on elevation and wind exposure. Like usual at this time of year, north-facing lines in the BV backcountry are keeping the snow cold and dry while everything else starts to warm up. What is unusual this year is the snowpack depth; even without the epic storms of the past two seasons (cross your fingers!) there is more snow on the ground here than I have ever seen. This is really opening up the terrain as the bushes become increasingly buried, and I am seeing new lines every time I head into the backcountry. Now that the days are getting longer and the temperatures are a little more mild, it’s a great time of year to explore. Grab a friend, make a plan, and go find your new favorite backcountry line! Saturday’s bright sun and warm temps made for some amazing ski touring conditions, and my crew and I all worked on our sun tans while we skied creamy south-facing lines. However, all that solar energy really thickened up the snowpack. Now that temperatures have fallen again, I expect that south-facing aspects are going to have a significant breakable sun crust. Our north-facing terrain is still staying shaded all day long and the snow there is dry and soft. With the addition of a few inches on Sunday and a few more last night, all the terrain that doesn’t have direct exposure to the sun should be skiing great. Ridgetops have become pretty scoured by all the high wind, but you only have to drop 30 feet before you are back into the good snow. With cold temperatures and high winds in the forecast for the next two days, you probably don’t want to be exposed up on the ridges anyways! Stay safe out there! I’ve always been drawn to the backcountry. The solitude. The promise of deep powder. The sense of accomplishment after an uphill battle. I’ve been waiting to get into the backcountry for years. I started snowboarding six years ago in the small hills of the Poconos. Most of my riding consisted of 45-second runs and the occasional trip to Vermont. My only knowledge of the backcountry was what I had seen in ski films. The backcountry was something that I had reserved in my mind for professional skiers, and it wasn’t until I came to the University of Vermont that I realized it was as normal as taking a hike in the woods. Then, one day, I discovered Bolton Valley. A mountain that had a killer local atmosphere but featured access to some awesome terrain. It felt like home - it made me feel comfortable enough to push myself. First, into the trees and then finally, the backcountry. I arrived this past Saturday to my internship with the Marketing Department at Bolton Valley, expecting to spend the day in the office helping out with events and taking a few laps on the groomers. But to my surprise, the Director of Marketing, Scott Pelligrini, had a different idea for the day. After the recent snowfall, he proposed that we head out to the backcountry and do an intro to splitboarding day. The stars had aligned! An immense feeling of excitement and nerves came over me. Before I knew it, we were on our way to the rental shop getting me fitted with a rental for the day. Let me tell you, the Bolton Valley Nordic and Backcountry center HOOKED it up! I was fortunate enough to ride on a Weston Backcountry splitboard - specifically, the Riva. The Riva is Weston Backcountry’s first women-specific board and features a rocker-camber-rocker profile. It was equipped with Spark bindings and Pomoca skins. It was a BEAUTIFUL set-up. Scott took the time to teach me how to properly set-up my board and bindings, so I was starting to get familiar with the gear and understanding how it worked. After making it out onto the snow, Scott showed me the importance of having your “curved-edges facing in” and I took this time to admire my set-up. This was really happening. I was about to take my snowboarding ability to the next level. We spent the next few minutes talking about the route that we were planning on taking. It was just a short uphill to Wilderness through the trees - the perfect intro to splitboarding. The first few steps were rocky. It was a different sensation that I had previously not experienced, but as we made our way into the woods, the only sensation that mattered was how I felt being in those woods. It was a whole new world - seeing the immense amount of untouched snow wrapping the trees like a warm blanket. There was only silence and the trees to keep us company as we made our ascent. As we got further up the mountain, we decided to take a longer route. This new route would feature an ascent up Gardiner’s Lane to Bryant Camp and then up Heavenly Highway to Wilderness. I don’t think either of us were expecting it to be as long as it was, but we were both excited to be in the woods. The route featured a series of uphill battles as we traversed further up the mountain. Luckily, I was with a trusty guide who was determined to get us up and down in one piece. As we made our way up, the change in elevation was becoming more and more apparent. We were no longer traversing along a defined flat track. At times, we would be on narrow route almost vertical to the mountain. It was not only physically challenging but also mentally. In situations like these, it is so important to trust who you are with and also the gear you are riding. I had confidence in both and was able to push through even when the going got tough. Once we made it to the top, I couldn’t believe it. I was proud of myself for keeping my morale high even when it was not the easiest thing I could’ve been doing on a Saturday afternoon. I’m so glad I had the opportunity though, because it has opened up this whole new world for me. I can’t wait to get back out there and start really diving deeper into the backcountry and forcing myself to progress as a rider. Here we are people. Almost to the end of fall, and to the beginning of winter. The leaves are so close to being done for the season and soon there will be this silent lull at the mountain until the lifts start churning. Well, that is unless you sign up for this awfully rad 6 week preseason workout class aimed at getting you prepped for the gnarliest season of your life. Tomorrow (10/25) is the last day you are eligible to register for classes. The class will be taught by BV local and fitness professional Colleen Perry. Colleen has been working as a personal trainer and group fitness instructor with clients for over 10 years in a variety of fitness modalities. She enjoys working with all levels of fitness from beginners to elite athletes. Colleen will encourage and motivate each participant to perform to their personal best while creating a safe and fun environment to accomplish this goal. The 60 minute class will meet twice a week for 6 consecutive weeks and be offered right at The Bolton Valley Nordic Center. If this sounds like you and you want to sign up, or you would like more info, click here. I have been a skier and rider at Bolton Valley for the past 12 years. This is my first year working here and so far I can't think of a better place to work. The people I have met so far in my first month here have been friendly and welcoming. To be employed in what is my neighborhood ski area only to find that the people are just as cool as when I was a guest leaves me excited and giddy for the winter. I live in Burlington and the highway makes it an easy cruise to and from the mountain. Come join me and the rest of the family here at Bolton Valley where work is less of a chore and more of a lifestyle. With the DesLauriers family buying the mountain back and living so close to the lodge, you could be skiing with the owners on any given day. Something not every mountain can say. You get a free season pass with employment and with night skiing until 10pm, the lifts spin for 79 hours a week. There are plenty of ways to mix and match your schedule so that you can get some time on the slopes before and after your shifts. Couple that with access to 13 other mountains via the Freedom pass, included in your season pass and there are many opportunities to get plenty of diversity on the slopes this winter. For those who have children and need child care on holidays and weekends we also offer 50% off on child care for mountain employees so they can work with piece of mind. You can also enjoy other generous discounts on things like lodging, food and beverage, and friends/family lift tickets. You will have free access to our Sports Center that has a pool, hot tub, sauna, free weights, cardio machines and more. You can apply online or come to Bolton Valley Job Fairs on October 28 and November 11 from 10am-2pm and take a look at what jobs we have to offer. 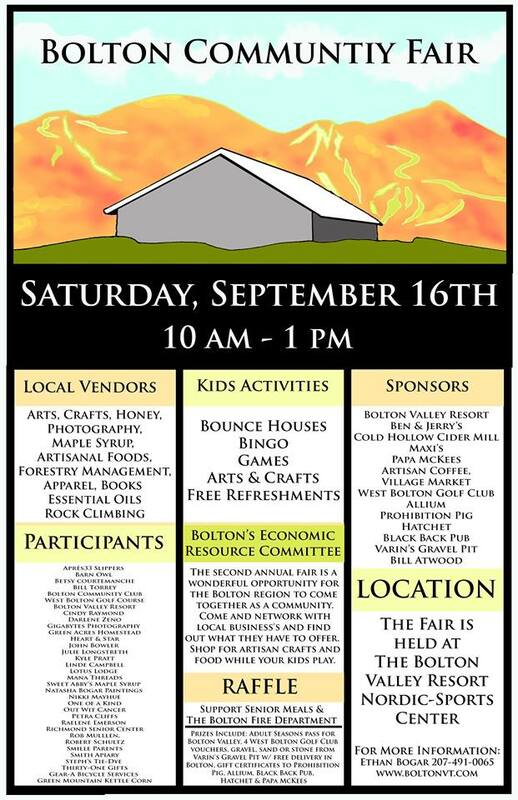 There is a exceptional opportunity coming this Saturday, September 16th from 10am-1pm to see and meet over 40 local vendors at our Bolton Community Fair. The event will be located at our Sports Center. It is free to attend and there will be access to bouncy houses for the kids, beer for the adults and pizza for everyone. We’ll be selling and printing season passes at the event so this is a great time to purchase your pass before the price goes up after Sept. 25. The fair is a wonderful event where you can meet local business people who provide a wide range of products and services from local arts and crafts to forestry management and rock climbing. I wouldn't miss the opportunity to network and connect with the local working force while also supporting their homegrown business. This year's raffle will help support Senior dinners and the Bolton Fire Department. Prizes include a adult Bolton Valley seasons pass, 4 vouchers for the West Bolton Golf Club, a load of gravel, sand or stone from Varin's Gravel Pit with free delivery in Bolton from Bill Atwood, gift certificates to Prohibition Pig, Allium, Black Back Pub, & Papa Mckees.